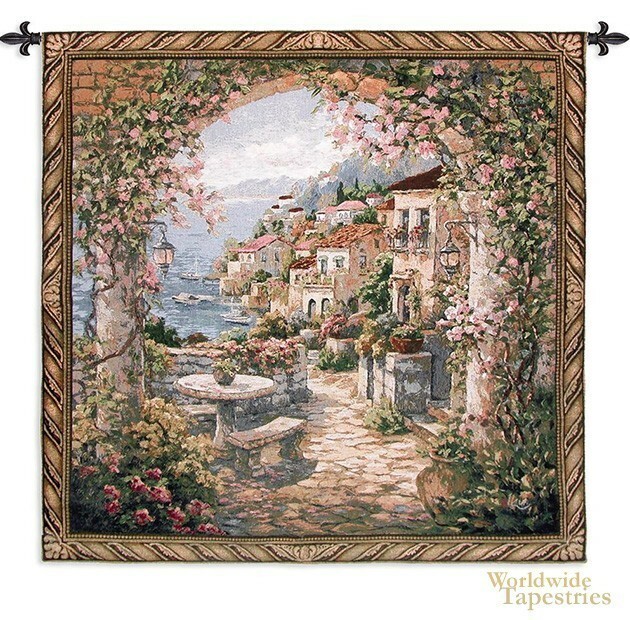 Based on an artwork of Yuri Lee, this tapestry captures the charm and beauty of life on the seaside. The cobblestoned terraces, the traditional villas and the abundance of flowers in the cityscape, provides the typical Italian setting of a village by the sea. The idyllic climate in the Mediterranean is reflected here, as are the beautiful buildings and flora, in this typical Italian village that are coveted as the perfect escapes for experiencing life in rural Italy. The gentle dreamlike quality, which is a signature of Lee's work complements this subject matter very well. This tapestry "Seaview Hideaway" is backed with a lining and has a tunnel for easy hanging. Note: tapestry rod and tassels, where pictured, are purchased separately.